Chinese Solar Lipo powered PIR led lamp. This would nicely fit into Chinese solar Lipo powered PIR led lamp. We would only need 3,3 regulator to feed radio and arduino. This way we could have smart mysensors aware security solar powered PIR sensor and LED garden lamp. But it would be challenging to hack original circuit so it would be mysensors aware. I'm willing to check elements and do additional circuit verification. But ic is without id. I think it is BISS0001? What do you guys think? I can provide additional information if somebody is interested? @gyro Looks like the BISS0001 and this one needs 3V3, so I'm fairly certain there is a 3V3 DC regulator in the SOT-23 format on the board. There is a SOT-23 package type chip next to C3. Can you measure the voltages over the pins ? Middle one is ground, left small pin is input (I think), right of ground is output, large in on the other side is ground as well I think (just stating from my feeble memory). Just measure DC voltage. 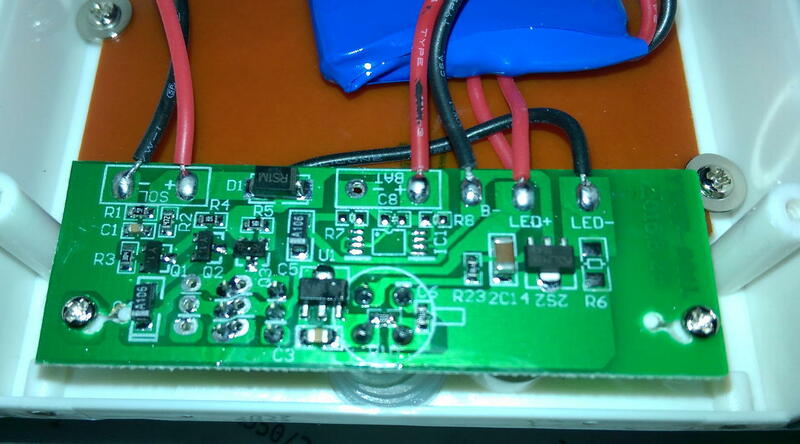 If one side is 3.7V-4.2V, that could be from the LIPO battery, one of the other pins probably gives 3V3. If i'm right, you could tap that pin for power. I do not know the output pin (which can drive the leds on) of the BISS0001, but probably one of the transistors (Q1 to 4) is driving U3, which is what I assume to be the IC driving the power to the leds. But that could be the LIP charging chip. @gyro Measure the pins on U3. BISS output signal should be on pin 2 - i have meassured voltage (2.4V), which i think is enough to trigger digital input on atmega328 ? So if I lift pin 2 up and connect it to atmega328 input, i could detect motion with mysensor PIR libray ? and then if I connect another digital out pin on circuit where was previous soldered BISS0001 pin 2, i can control the LEDs with mysensors relay scetch? then i add rule in my controller (OPENHAB) when PIR detected motion - turn light on for 30s or blink if alarm is triggered ? Please correct/comment me if i am thinking this wrong? The lamp should have day/night sensor but i dont see any LDR ? Really interested by your investigations, as i stared build some sensor based on this box (ie the Weather station project). But I had trashed the original pcb and replaced by mine, rebuilding a charger, and getting rid of the builtin PIR. But if it is enough hackable, why not keep it as an addionnal sensor. So please post your results here. Solar+ --------- Resistor ------------ BIS0001 pin 9, so the challenge would be to find which resitor it is, explode it with a cutter or a drill, and put pin 9 to high (ie 3,3v) to make PIR alway ON. BIS0001 pin 2 --------- Transistor (base) : remove this connection and connect pin2 to an arduino input and the transistor base to an arduino output. On incoming Mysensor Message1, set output PIN to High for 30 seconds. On incoming Mysensor Message2, set output PIN to blink for 1 hour. which is great that the atmega328 will have full time 3.0V power source. so i will try to break pin 2 connection to arduino input, and then connect (transistor base) to an arduino output. at day (solar cell power is high -5V), LEDs are off. what disconnects (control) the load (LEDs) when battery is being charged from solar cell? output pin will configure the LED HIGH intensity interval? then wire to arduino output (pin 4) resistor 1K and then connect to right part of removed transistor. Now i can use the solar light as motion detection and control LED lights independantly. root@kali:~# mosquitto_pub -d -h 192.168.1.115 -t "mygateway1-in/11/1/1/0/2" -m "1"
root@kali:~# mosquitto_pub -d -h 192.168.1.115 -t "mygateway1-in/11/1/1/0/2" -m "0"
Keep up the good work debugging this chinese box ! 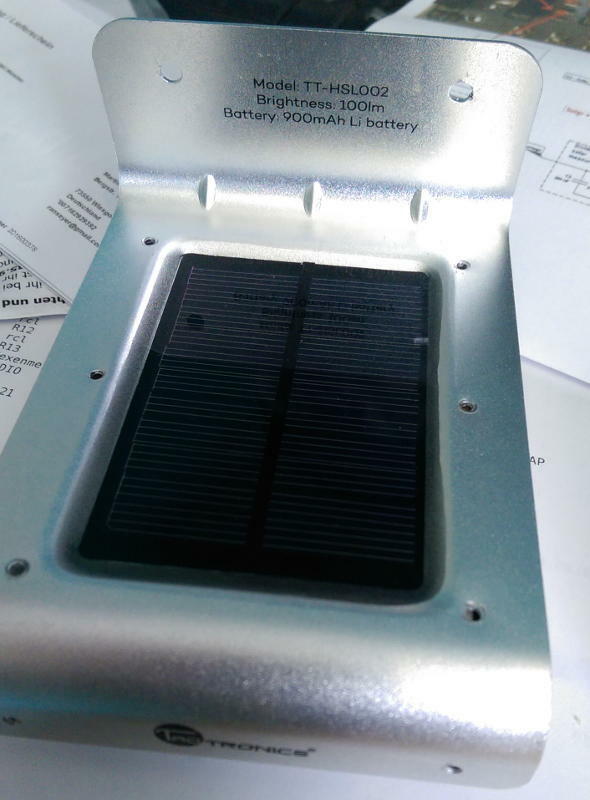 This box is a really good value for money box to build mysensors projects ( at least box + lipo + solar panel). If your investigations let us to also use the built in Charger / PIR / LEDS , it would just be amazing. Please keep us in touch ! some progress was made, but i need an hardware advice. This is the part of schematic that drives the LEDs. First the battery is not connected directly (as here in schematic) but over protection IC logic. When solar cell voltage is higher than 0.7V , LED is OFF (sort off day/night sensor). What is the the correct way to connect arduino pin D1 to take control over above described default behavior? (disconnect the line at SW4 and remove R9 -1Mohm)? Which voltage measurement technique (internal reference or reference to regulated Vcc voltage) should i use to meassure Lipo voltage? What are correct/recommended resistor value for optimal battery utilization. Would make sense to measure also solar cell voltage? 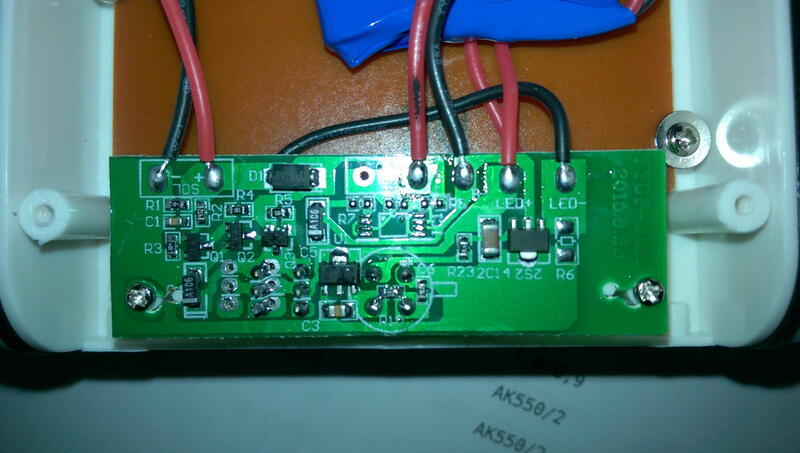 Since you are using a atmega328p, it does make sense to measure the battery level and solar power level. If you make a node which does NOT sleep all the time, then monitoring both voltage levels is the starting point to make decisions. I'm guessing you want to add a node using the battery, so a node that sleeps until something needs to be done. In that case we need a trigger when the light is bright enough to switch off the leds, and dark enough to switch them on again. The trigger to wake up from sleep should be a voltage change on pin D2 or D3, and the voltage difference needs to be from below the lowest "HIGH" threshold to above the highest "LOW" threshold. Check the specification for the atmega328 you use, as this depends on the working voltage of the processor. The question I ask myself is what is the lowest voltage you get from the solar cell ? Looking at the circuit, they use the voltage of the solar cell to open the gate of a transistor, which then pulls the emitter voltage of a transistor to ground, which in turn switches off a second transistor with is feeding the battery current to the LEDs. Your question of the values of R2 and R11 is actually how to measure voltages over a resistor divider? You can choose any value of resistors, but their ratio is what is important. @GertSanders I think i managed to successfully connect arduino with solar lamp. Can you use the motion seperate from the liight? Or is the light switching only on lux? @Dylano the purpose of this project was exactly what you have asked. The lamp is now mysensors aware. Every task can be operated separately. When there is dark, the trigger is send, when the sun shines, the trigger is send. (transistor as switch). In scetch i use it as magnet switch part of code. When trigger is received (can wake up arduino), than you decide with controller what you want to do . PIR acts as classic PIR sensor and can also be used as trigger. (can wake up arduino), than you decide with controller what you want to do. Will see... when i have time..
Only i do not understand exact the wiring of your example. Will you please make a list of exact stuff to buy. And make some more pictures, from the good places..
And a thing that i see. You use D2 from the arduino. Is that not a one for the radio? @gyro is there a reason you used high/low intensity with resistor instead of PWM? @siklosi Resistor is used as transisistor base resistor. This was the best way to connect i could think off. But you need two output pins - 2 transistors are controlled. @Dylano Great to hear that the light has the same board...please post a picture. My light is still protoype connected together on protoboard - connected to arduino pro mini - i can post only a picture connected elements on protoboard for now. I am trying to put all together in openhab now. I will try to make a list of exact elements. I have free D2 pin on arduino pro mini. As the easiest way to disable dimmed mode this lamp? Got myself a similar PIR LED lamp. The functionality seems like it is the same but the circuit board is different. It looks like an updated version (at least i like it more from your pictures). Could you post an order link. I think this one should be even easier to intercept with "mysensors", beacause i see only two transistors and circuit connectios are clearly visible. take a photo of PIR sensor from front side (is there any ic elements)? -if it is output from PIR just remove R3 and IC ouput goes over resistor to you arduino input. I guess you meant U4 is the 3.3V regulator. I measured it to 3.3V and HT33 should be a regulator. Q1 and Q2 I think are transistors. U3 handles the solar charging. U1 is for the PIR but unfortunately there is no text on the chip. I will get you the link tomorrow but it is quite easy to find on aliexpress. Also it took like 10 weeks for it to arrive so maybe another seller would be a better fit. There is not much on the other side of the board, just a status LED, a button to turn it on and the PIR. I'm sorry I did not test the device I just read the manual so I think that yes it has 2 modes for LED brightness. Don't be sorry.I am not an circuits expert, I just try help you figure things out. You wil have to test this lamp a little bit. it looks that Q1 drives U1 active/not active when there is sun, but how/what turns on dimm lights in dark? Did you measure U1 pin 6 when pir active/not active? In the application I will use this one I actually do not care so much for the built in PIR and LED, I just see it as a smart enclosure with a solar battery power-supply built in. I will tap in to the 3.3V regulator to power a pro mini that has an external PIR and (LDR) Light sensor. In addition to this I would like to add voltage measurement for the battery. BTW, did you komplette your sketch? I would like to copy the battery voltage sensor part. I will look att figuring out the circuit later, it does not look to complicated. I did try some battery measurement variants. The following code works best for me. I suggest that you first try the following sketch. This means that you use A0 for measuring right? And you have used 1Mohm and 330kohm for the resistors? Thanks for the code and the additional info. Measuring the battery seems to work as expected but using the Internal reference seems to mess with the light level measurement LDR. Is it possible to use indifferent reference for different analog inputs? Or do I need to recalculate my LDR voltage divider? I managed to squeeze in a pro mini and radio that is now powered from the 3.3V available from the built in circuit board. It has battery voltage measurement, light level and a external PIR. @korttoma great that you maneged to connect it lamp.. I don't know if analog reference is than set for all analog interfaces.. I have figured out that I need to raise alarm for lower threshold for battery to higher than 3V (now is 2.5V!) because regulator voltage drop is ~250mV, and mini pro drops out at around 2.8V..
As you can see there is very different PCB. Do you have a hint for me if modification makes Sense ? Take a picture of other side of circuit also. No connections, but a board name: YYGF-601L.